Properties in Caryville average 4.8 out of 5 stars. Dreaming of your summer vacation? Property 1: Dreaming of your summer vacation? Book Your Summer Vacation Here! Property 2: Book Your Summer Vacation Here! Property 3: Dreaming of your summer vacation? "SUITE SPOT". Million Dollar View of Norris Lake! Just minutes of I75. Property 4: "SUITE SPOT". Million Dollar View of Norris Lake! Just minutes of I75. Property 9: "Onawim" Lakefront Cabin! Cozy setting, private boat slip and swim platform. Lake Front Prop, includes two kayaks, great covered dock w/ jet ski dock. Property 13: Lake Front Prop, includes two kayaks, great covered dock w/ jet ski dock. 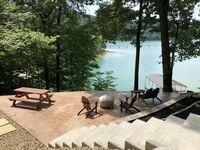 Norris Lake Front Cottage With A Private Covered Boat Slip And Swim Platform. 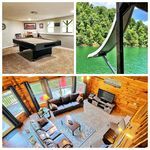 Property 14: Norris Lake Front Cottage With A Private Covered Boat Slip And Swim Platform. Newly Renovated, Rustic Style Cabin! Property 18: Newly Renovated, Rustic Style Cabin! "Good Company!" -Newly renovated 8br/4ba, lake front cabin in quiet cove!! Property 21: "Good Company!" -Newly renovated 8br/4ba, lake front cabin in quiet cove!! Property 22: ❤️Valentine's Day Getaway ❤️Save $300! TN Norris Lake & Clinch River Trout Fishing - Out The Back Door! Property 23: TN Norris Lake & Clinch River Trout Fishing - Out The Back Door! 22' pontoon available for rent. Property 24: 22' pontoon available for rent. Cozy Lakefront Cabin in Quiet Cove w/Private Dock! Property 29: Cozy Lakefront Cabin in Quiet Cove w/Private Dock! Rustic Briceville Cabin w/ Porch Tucked in Forest! Property 30: Rustic Briceville Cabin w/ Porch Tucked in Forest! The beautiful Sundance Lodge log home in peaceful cove. Paddle Board included! Property 41: The beautiful Sundance Lodge log home in peaceful cove. Paddle Board included! Riverfront Briceville Cabin w/Patio & Fire Pit! Property 47: Riverfront Briceville Cabin w/Patio & Fire Pit! Loved the stay, we had fun!